My second freebie published in smashing magazine. If you have used these images in your projects, leave me a comment and a link to the page, i woud love to see it! Sorry, but I can’t find a download link. Am I blind or are these icons not available anymore? I tried to send you an email, but didn’t go thrue, so hopefully you check this now, the link is fixed! it’s in “here” part of the description. I used one of the birds on my website and I added you in the credits section : http://www.martin-damien.fr/Credits-et-mentions-legales . Cool, happy to hear! I went to check out your site, thank you for the link! 🙂 Wish you a nice summer! Beautiful, adorable! I used one for my twitter account icon (@jenboree). Also tweeted your website and smashing mag blog post where I found them. Thanks so much! I love these happy little people for Twitter. Thank you for the darling bluebirds! I will use them on all of my sites and be sure to credit you. I used your Twitter Bird reading the book for a reblog post regarding using Twitter in the classroom. Thanks for this resource. Your work is amazing! I love this pretty Twitter bird set. It is so cute and engaging. 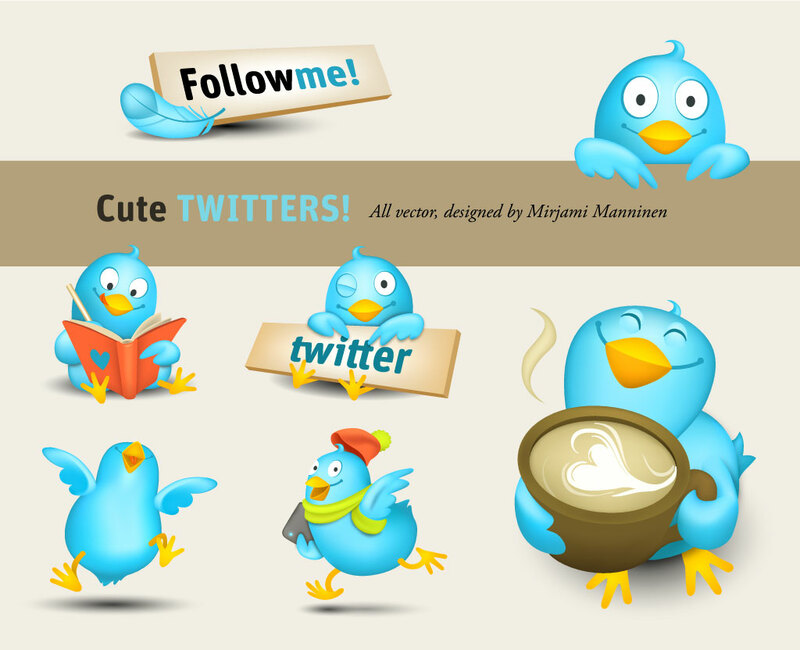 I’m using the Twitter bird that is drawing in her book for my home page. I used one of these cute little birdies on club-mate.ch and mentioned you with a link in the “infos” section. I used your Twitter Bird icons for my Twitter page (mandarin4kids). I added several Mandarin words along with the icons. They work beautifully. Thank you so much! Thank you everyone for your links, credits and comments! I have been very busy with some interesting stuff all autumn and winter, and have hardly had a time to catch up here 🙂 But…I´ll be releasing a new freebie soon, when i just get time to finish it! Icons is very nice and cute! The birds are great!! Thank you so much! Twitter birds are so cute! and I used one of the birds on there. Hi, extremely nice icons. I want to use it in my site. Can you tell me what font you used in the “followme!” icon. thanks a lot. great icon set! Thank you so much for the great design. I used your twitter sign with my own logo to make an unique twitter button. I credit you in my impressum. Maybe you can include my website in your references? I’ve used the bird with the coffee cup on our Volunteer Centre website at http://www.volunteerairdrie.ca and we just love it! Thank you for providing these icons! Very well done! I’m using your icon for Goodbye, Buddy! a twitter unfollower monitor. Hi! Thanks 🙂 thanking you all too for the links and nice words! Coffee cup is my fav too.. 😉 thank you! ¡gracias, que disfruteis los iconos!, ¿de granada no? ¡que suerte vivir tan cerca de Sierra Nevada! In my opinion, the best Twitter icons! I am using one of your cute tweetie icons on my personal blog. Looks great! Thanks a lot for this free icon set! Hi Mirjami thank you very much for these wonderful icons! Beautiful set…I love the Follow Me with the feather…I just want to change it to “Follow Us” do you mind providing the font you used? I’m just starting to learn and build websites, and being able to use icons for free is great since I don’t have a lot of money to pay for them yet. Thank you so much for the great design. I used your twitter sign with my own logo to make an unique homepage buttons. @hes – checked out your porfolio – nice! @deborah, thanks for the links! @park woo chul -thanks! went to check your site, but understood very little 😀 well, it was a lots of blueberries there…! @Wolfgang Junghans – Vielen Dank für den Link and deine netten worte! I used one of the little birds on my blog and added you to the credits. Thank you very much, they are lovely! Thanks for your freebies, I’ve used it in my latest blog post.. Thank you very much for the nice Twitter design. I used it at my site (Education site for montessorischools). Heippa, käytin konsernin sisäisissä Twitter-ohjeissa ja merkkasin nimesi luonnollisesti creditseihin 🙂 Kiitos! I was looking for a nice twitter icon to present our new twitter feature on our website; and found your icons. They are very cute, exactly what I was looking for 🙂 I hope, I used it well in our online articel. First Thanks for these very funny twitters icons ! Great Icon Set, thanks for sharing! Nice icons, keep that good job mate!